Multi-Racial Read #19: Just an Overnight Guest- And a Giveaway! Congratulations to Linda Phillips who won Kathy Erskine's book Seeing Red. It's been awhile since I've reviewed a multi-racial book and Just an Overnight Guest by Eleanora Tate fits the bill--but from a different perspective than the other books I've reviewed as background for writing Half-Truths. The only thing wrong with nine-year-old Margie Carson's life in the small town of Nutbrush, Mo. is that her trucker father isn't home to spend enough time with their family. That is, until Mrs. Carson decides that 4-year-old Ethel needs to stay in their "gray-shingled one-story house [which] fit only Daddy and Momma and Alberta and me--there was no place in it for Ethel." (p. 29). Margie's anger knows no bounds as she faces the humiliation of Ethel wetting the bed Margie is forced to share with her, Ethel calling Mrs. Carson "my Momma," and her own friends' scorn. But when Ethel tells Margie that her "toys" are her mother's empty beer bottles and bottle caps, Margie begins to understand the life that Ethel has lived. Although a wise neighbor advises Margie that she's not the baby anymore, it takes several major growing-up moments before Margie makes room in her heart for Ethel. I won't spoil the ending but suffice it to say, readers will empathize with Margie's struggles and appreciate the decision she makes in the end. Although the book is recommended for ages 9-12, because of the nature of the story I personally would suggest a slightly older reader. (Caveat: I'm a very conservative reader and Eleanora told me that 8-year-olds have read this book and liked it!) Like the Boy in the Striped Pajamas that also features a young protagonist, I think the content of the book requires a more mature reader. The characterization, character's voices, and historical accuracy are spot on and lend themselves to a good read-aloud in an upper elementary or middle school classroom. 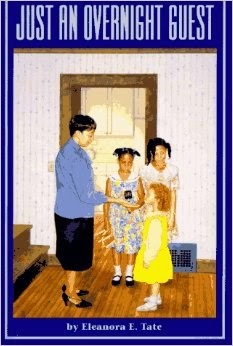 The sequel to Just an Overnight Guest is Front Porch Stories at the One-Room School which was original published by Bantam/Skylark Books in 1992. To enter to win my gently-used autographed copy of Just an Overnight Guest, please leave me a comment (and your email address if I don't have it) by 8 AM January 1. Who will be my first giveaway winner in 2015? Congratulations to Cindy Clemens who won a copy of The Boy Project on last week's blog; thanks to all for entering. Here's another chance to win a super book- this time for the favorite middle grade boy in your life! When I received a copy of Kathy Erskine's middle grade novel, Seeing Red, (Scholastic, 2013) I was happy for the opportunity to review it. Although set in a different state and time period than my WIP, Half-Truths, (Virginia, 1972 as opposed to North Carolina, 1950), racial tensions and multi-generational secrets create the backbone of both stories. Twelve-year-old Red Porter's world is falling apart. His father just died and his mother thinks she needs to move him and his younger brother back to Ohio. Red is determined to save their convenience store (aptly named, "What-U-Want") and Porter's garage--the car repair shop that was built by Red's great-great-granddaddy over a hundred years ago. Red's roots burrow deep in the town of Stony Gap and when his mother puts the house up for sale, Red does everything in his power to circumvent the sale. 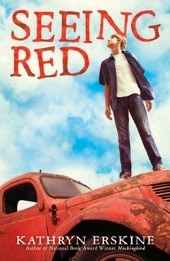 But Red's story is bigger than just a grieving boy who wants to hold unto his home place. It's a coming-of-age story full of the choices Red must make. In an effort to prove himself worthy of becoming a part of a gang of guys, Red's loyalty to his black friend Thomas is tested and found lacking. An ongoing family feud between his close friend Rosie's family and the Porter family over disputed property lines puts both Rosie and Red in precarious positions. Red must consider the consequences of coming to Rosie's aid or not. "I don't think it's how you look what makes you different. I think it's how you act." "How? It's a pretty bad legacy." "I know it is. But you can do it." "How," I said again, not as a question. I didn't really expect an answer. This is a great book to use in a classroom to discuss racism, grief, forgiveness, and family relationships. You can find a discussion guide here and a playlist of music that was popular in the 1970's. To get this giveaway in before Christmas, I'm giving you only a few days to enter. Please leave me a comment by 8 o'clock on December 22. Make sure you leave me your email address if you're new to my blog. I look forward to giving this to a young reader who will be inspired by Red's story. The Boy Problem--and an Autographed Giveaway! In between drafts of my manuscript I’m working on character development using worksheets provided by the faculty of KidLit Summer School—a marvelous online class created by Kami Kinard and Sudipta Bardhan-Quallen. The first one that I tackled was by A.C. Gaughen where she challenged writers to consider the rules governing their character’s voice and point of reference. Since I recently read The Boy Problem by Kami Kinard, I thought I’d use Gaughen’s worksheet to review Kami’s book, a companion middle-grade novel to her first book, The Boy Project, which I reviewed exactly two years ago. On the opening pages the reader meets breezy, funny Tabbi Reddy who believes in signs and desperately wants a boyfriend. Even spilling a pizza on the floor of the local pizza joint turns into a prediction about landing a boyfriend. She tries to convince her best friend Kara, and Kara’s boyfriend Chip, that the cheese on the floor is a lot more than a messy pile of mozzarella. “I guess I can kind of see it,” said Kara. “This is the best day of my life!” I said. 2. She is totally an 8th-grade girl with a BFF who she can risk being slightly crazy with. 3. She is slightly over-the-top dramatic. Tabbi’s point of reference is math. Sprinkled throughout the book are equations, charts, lists, diagrams, and line drawings. 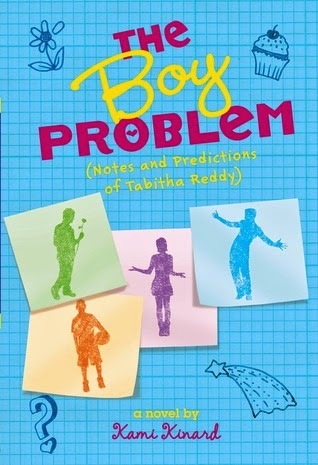 For example, one of Tabbi’s inner goals is expressed in an equation on the first page at the pizza shop: “ 2 +1 = Third Wheel.” She attempts to meet her external goal (gaining a boyfriend) by methodically listing “Boys who have potential,”; creating a love-predictor cootie catcher; surveying how other girls caught their boyfriends, and creating a game that will predict who her next boyfriend will be. At the same time Tabbi is trying to find a boyfriend, her Algebra teacher is also tackling probability—with a more academic type assignment. 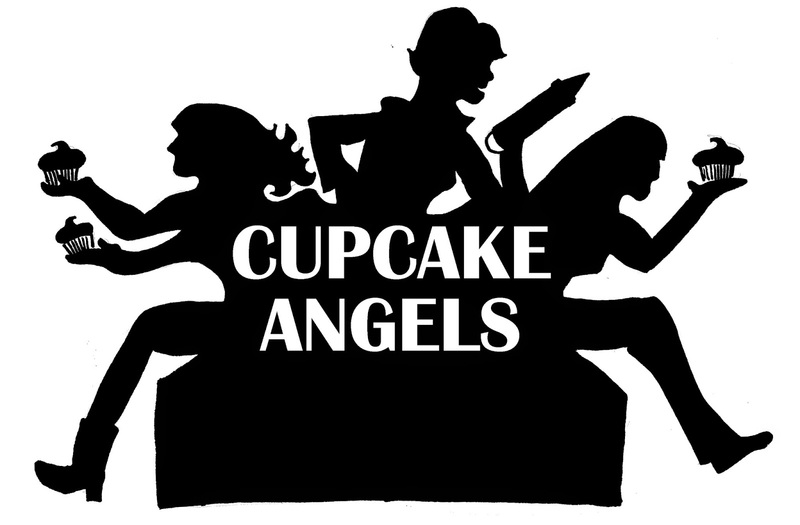 When Tabbi and Priyanka--a cupcake lover and the last person in the world Tabbi wants to be assigned to work with—are teamed up on a project that uses probability to predict the future, not only does a cupcake war take over their school and they raise money for a truly good cause, but yes…Tabbi finds her unexpected-yet-could-have-been predicted boyfriend. Although the book is full of Tabbi's boy-craziness, I appreciate how Kami wraps the book up at the end. I don't want to spoil it for you, so let's just say, it's a great "there-is-more-to-life than-finding-a-boyfriend" ending. To win an autographed copy of this fun book for your favorite middle grade girl, please leave me a comment by December 18. If you let me know which trailer you like better and your reason why, I'll enter your name twice. Or, become a new follower of my blog and share this on your social media of choice, and I’ll enter your name in the hat twice also! 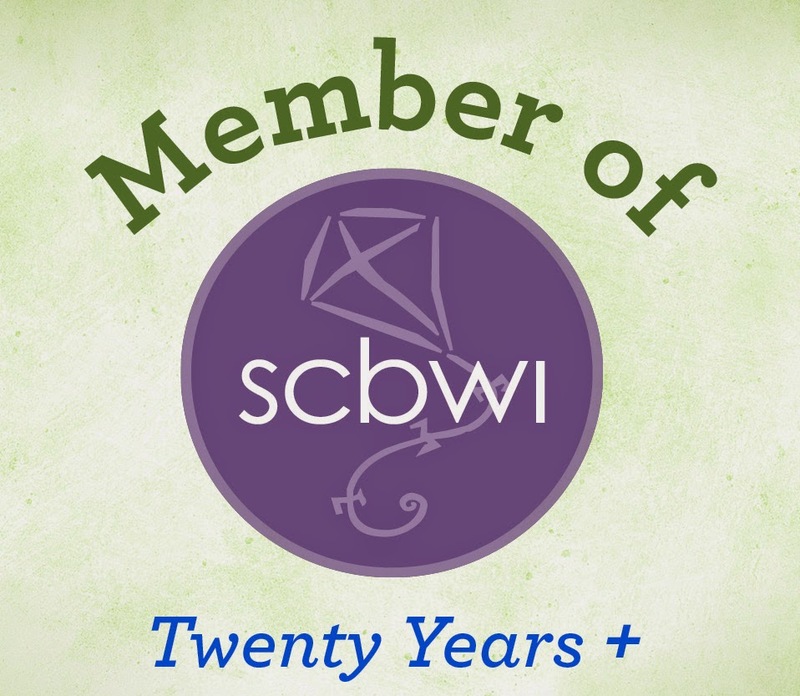 Make sure you follow Kami and Sudipta's blog to stay up to date for Kidlit Summer School 2015! Congratulations to Melodye Shore who won a copy of Leigh Sauerwein's book, River Music on last week's blog. I had originally planned to post another book giveaway this week, but this post practically wrote itself and I couldn't resist sharing it. Stay tuned--more giveaways coming soon! 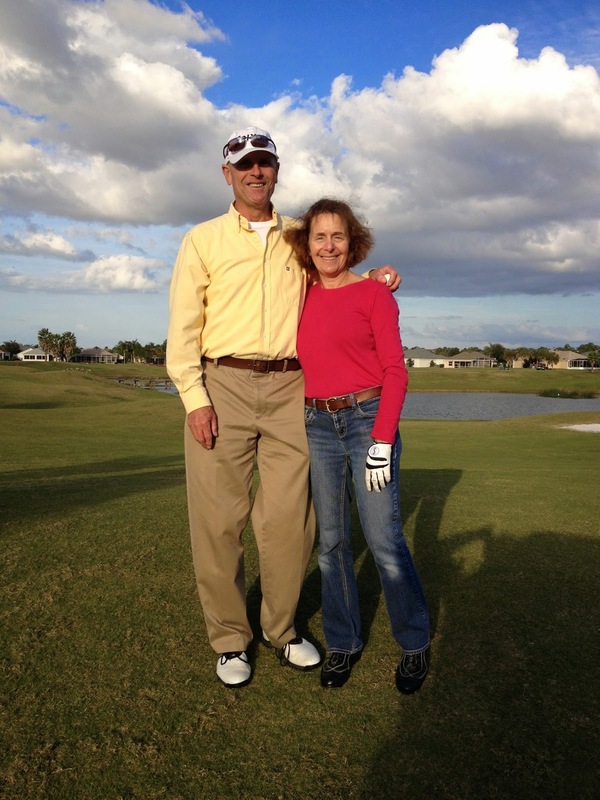 "I had no idea how hard a game golf was, until I started trying to play," I wrote in a recent email to Rebecca Petruck, my book doctor/editor/cheerleader for Half-Truths. Writing that made me realize I've said the same thing many times about writing my first novel. Prior to starting Half-Truths, I had no idea how difficult and long the process would be. I just knew I'd always wanted to write a book for young people and if I wanted to do it, I better get busy. I can't say I've had that same burning desire to play golf. This particular adventure was my husband's idea. Creighton and I before teeing off. As a child, I remember my father commenting that golf was a silly game which involved men chasing around a small white ball. He was right and wrong. Golfers do chase around a small white ball. But occasionally, they also drive, chip, or putt it correctly and much to their delight--the ball goes into the hole. It takes a ton of practice to be successful. Time on the driving range. Lessons. Time on the putting green. Persevering after taking a bad shot. Learning that even small "tweaks" in how I position myself in front of the ball, (off my left foot, middle, right) how the club head is faced (open/closed/square) influence the outcome of where the ball lands. Sometimes you have to change your swing all together. Often you need a break away from your clubs. Novel writing parallels golf in surprising ways. It takes a ton of practice. Writing workshops. Time at the computer. False starts. Perseverance. Editing. Lots and lots of tweaking. For example, Rebecca commented on my third draft: "Carol, currently, the girls sound the same and are hyper-focused on fashion and skin color." Sometimes writers need to change direction as when Rebecca pointed out, "Think about the difference between rote description, and description that reveals something about the character. When you describe the external world around them, it has to be in order to reflect how they interpret it, what it means to them and how it feels….You write beautifully, but you’ve barely left yourself any room to do so between all the dialogue and descriptions of things like dresses and hairstyles." 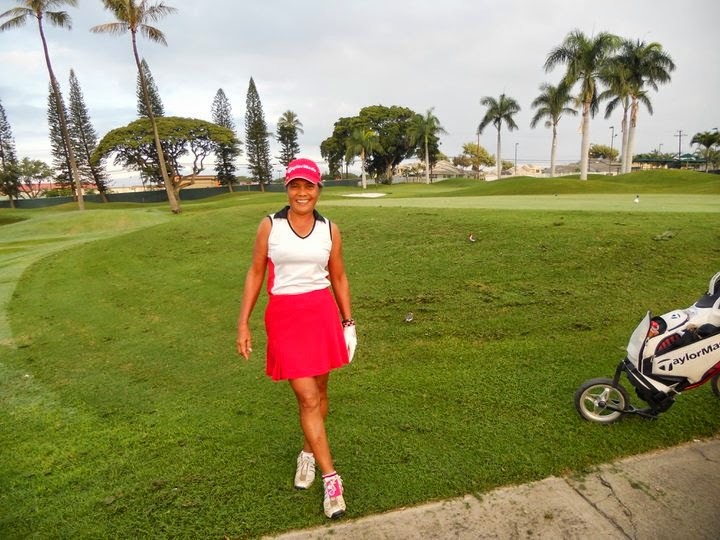 Both golf and writing take a ton of practice and perseverance. After I made the changes she recommended and drove the ball better, she congratulated me on listening to her advice. "Not everyone listens, you know," Cion said. "Lots of people think they already know everything." I shrugged and said, "I'm a beginner; I have a lot to learn." Writing a novel has been the same. Before I started I was a beginner. Along the way I've found qualified teachers who've instructed and shown me what I didn't know. I've been willing to listen and correct my work. And I'm driven (no pun intended!) to improve both. Here's hoping that in 2015 I'll do just that. P.S. Another golfer commented, "Golf is like husbands: you have to be patient with both." If you are a writer, what do you compare your writing to? If you're not a writer, what is your favorite simile or metaphor to explain your life, husband, children...or whatever? Please share! River Music: A Review, An Interview, And a Giveaway! Congratulations to Connie Saunders who won Liesl's Ocean Rescue in last week's giveaway. For those who didn't win, you have three more chances to win books this year, for yourself or as a holiday gift for a special young reader in your life. I'm happy to share these books with my fellow bibliophiles! Aptly titled River Music, this novella meanders through the lives of thirteen individuals connecting one life story with another. Set in the North Carolina mountains following the Civil War, each short chapter is written from the perspective of a different character; a well-executed feat by author Leigh Sauerwein. The characters are diverse and deeply portrayed: white, black, Creole, and Native American; young and old; rich and destitute; slaves, soldiers, and storytellers. But they are tied together by a young girl's desire to know the truth about her self: a story that is bigger than any one of them. …as he talks on about the comet, she hears the dark river more clearly than ever behind Will's soft, slow voice. She longs to ask him for something that he cannot define. If he answered her, if he answered her truly, she thinks it would feel like seeing the comet. Or a shining star. Tell me a true thing, she longs today. Tell me a true thing about me. tell me what you are hiding. I was intrigued with the how Ms. Sauerwein came to write the story and she graciously answered some questions about the work. Carol: What was your inspiration for this story? Did your life experiences influence its' creation? Carol: Why did you decide to write it in snippets from several characters points of view? Leigh: I wanted to try and get as close as I could, not just to the characters but to those times, to the landscapes, to give a sense of place, a sense of being within that time. Whether up in the North Carolina mountains or in parts of New Orleans, or out west. I could say that I wanted to make a kind of music, a weaving of the different places and voices. Or, if you like, a series of impressions, moments, which, taken together, would paint a whole picture. Carol: I loved the "List of Things" at the end where you listed important objects in the story. Why did you include it? Leigh: Thank you for saying this, it makes me very happy. “A List of Things” was very important to me. It gives the reader a way of re-experiencing the story through the objects that appear in it. It also grounds the story, because almost all the objects are real things that I found in my research. And when I would suddenly make a find, I would know: yes, this needs to be part of the story. So when I began getting to the end, I wanted to pay homage to the objects that had found their way into the story. They were such an important part of the voyage, they were like friends who had helped me find my way forward. Thank you Leigh, for your insights into your book and to namelos for providing a copy to give away! If you want to enter, please leave a comment by December 5. Share it on Facebook or the social media of your choice and I'll enter your name twice. 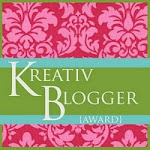 Liesl's Ocean Rescue and a Giveaway! Congratulations to fellow blogger, Rosi Hollenbeck, who won an autographed copy of Maggie Dana's book, "Riding for the Stars." 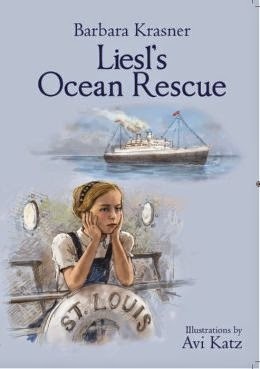 Liesl's Ocean Rescue, an historical picture book struck a personal chord for me. It begins with the awful events that surrounded Krystallnacht; an event which deeply affected my paternal grandparents. Like Liesl the main character in Barbara Krasner's story, my mother also escaped Nazi Germany at a young age and took an ocean voyage to America. But unlike Liesl, my mother's ship docked in New York City and her family quickly traveled to Ohio to establish a new home. Based on the true story of Liesl Joseph Loeb's voyage on the MS St. Louis, Liesl's journey was different. When the ship attempted to enter Havana on the way to America, the Cuban government refused permission to dock. After almost a week of negotiations, the ship--filled with over 900 individuals trying to escape concentration camps--was forced to return to Europe. Although Liesl's family came to America two years later, over two hundred of their fellow passengers did not survive the war. 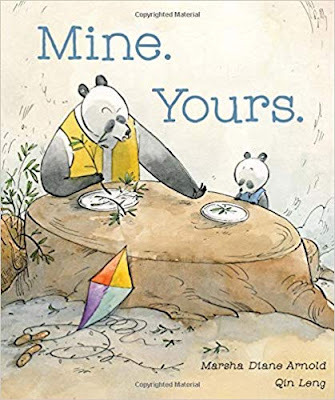 Although every page is full of black and white illustrations by artist Avi Katz, this poignant picture book will best be appreciated by children from 8-10 years old. It will enhance classroom instruction about the Holocaust, bring alive the difficulties that immigrants often face, and offer a great starting point for discussions about war and freedom. A teacher's guide can be found here. I would like to pass along my gently-used Advanced Readers Copy of this book. To enter, leave me a comment by Friday, November 28. If you are a teacher or plan to donate the book to a classroom library, let me know and I'll enter your name twice. Movies, Horses, Runaway Piglets--and a Giveaway! Congratulations to Linda Phillips for winning a copy of Grace Ocasio's book, The Speed of Our Lives. In August I reviewed Maggie Dana's book, Turning On a Dime. When I asked her if she would share about her love for all things equine, she sent me this post which first appeared on Tudor Robins' blog. I know you will enjoy this glimpse into how Maggie used her life experiences to inform her writing. The first question has many answers; so does the second, and writers have covered most of them, such as: I’ve always wanted to write . . . my high-school/college English teacher told me I was a natural . . . friends can’t wait to read my next story . . . I have so many ideas, I can’t keep up with them. Being a rider and a writer, I couldn’t wait to answer. Back in the dark ages, when helmets weren't required and we all rode in whatever outfits we could cobble together, my first riding lesson scared me so much that I didn’t try again for another three years. But all it took was the right instructor at the right stable, and I was hooked on horses for life. My new riding teacher, Tom Taylor, was strict, but he understood kids. He drilled us on the flat and over jumps, relentlessly, without reins and stirrups — we knew better than to complain — and when we flubbed up, Tom climbed onto our horses and showed us how it should be done. 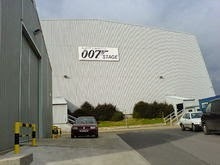 No matter how cranky our horses had been, they were complete angels with Tom.
. . . complete with gigantic sound stages, odd-looking props, and movie stars wandering about in full makeup and costume. Just imagine being eight years old, riding a scruffy pony, and seeing ALL THIS AMAZING STUFF as you trotted toward the paddock where your riding lessons were held. In addition to horses and ponies, the stable boasted a Jersey cow, two belligerent sheep, and a gigantic pig that had one litter after another. Added to this mix were numerous chickens, ducks, and turkeys that pecked at your feet if you weren’t super careful. Us kids -- the stable rats -- took care of them all. To pay for our riding lessons, we also mucked stalls, groomed horses, stacked hay bales, helped beginners tack up and mount, and made sure the animals didn’t escape. So, of course, they did. 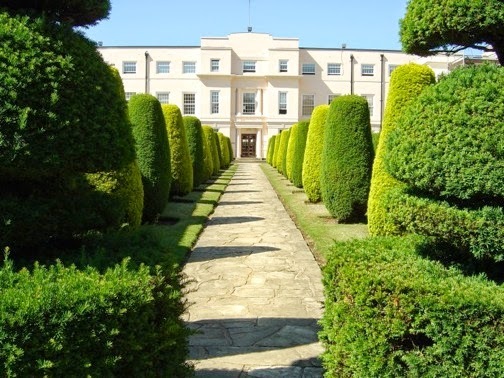 One afternoon, Mother Pig and her ten piglets got gloriously loose among tea roses, herbaceous borders, and topiary trees at Pinewood's most prestigious garden party. Picture, if you will, starlets with flowery hats and six-inch heels. Imagine film producers in tuxedos, sporting gold chains and Rolex watches, glad-handing gossip columnists and wealthy investors. Think about starched waiters circling with trays of chilled champagne. Then conjure up Mama Pig and her exuberant offspring zooming among designer-clad legs, upending buffet tables, and disappearing into the well-ordered shrubbery . . . all pursued by us delighted stable rats. We made it last as long as we could. The last piglet wasn’t captured until well after supper. But my best memory is about Maud, the Jersey cow, when I was put in charge of leading her from the stable and onto the set of a war film that involved rescuing a valuable cow from the German-occupied Channel Islands. The story (based on a best-selling book) called for a Guernsey cow — brown with white patches — and Maud was a Jersey (think Exmoor pony for color, as in beige). Now, this was a black-and-white film. The shade of brown wasn’t crucial, but the white patches were. So the film crew got to work with brushes and buckets of white paint while I held the cow … and it took rather a long time. All this was heady stuff, especially for me — an awkward eleven-year-old — and I was beginning to relax when Maud ruined her moment in the spotlight by relieving herself all over the sound stage’s concrete floor. A cow plop would've been bad enough, but this was urine. It splashed, it ran everywhere. I thought I would die of embarrassment. Everyone doubled up with laughter, even the tight-lipped director. 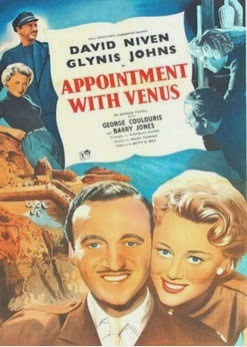 David Niven, the movie's star, collapsed into his canvas folding chair and insisted the scene be written into the script. A few years later, when I wound up working at the studios for Richard Attenborough and Jack Hawkins, I worried that someone would bring up the Maud incident, but nobody did. Now that you’ve heard all this, you might wonder how I’ve used it in TIMBER RIDGE RIDERS, my horse books for kids. Mostly, I’ve pulled on my riding experience, the lessons I learned from talented instructors, and the experiences I’ve had at horse shows. But in the third Timber Ridge Riders book I was able to use my knowledge of the movie industry. 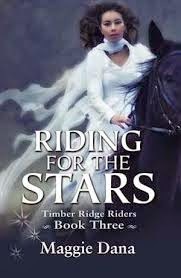 The book is called RIDING FOR THE STARS, and it’s one of my favorites of the series. Leave a comment by 6 PM on November 20 for a chance to win an autographed copy of RIDING FOR THE STARS. It would make a great holiday present for your daughter, granddaughter or niece! Maggie Dana also writes women’s fiction. Her novel, Painting Naked, published by Macmillan, is available on Amazon and other e-book sites.